A perfect blend of industrial and rustic elements, the Devons Coffee Table celebrates mixed materials for a look which defines urban chic. 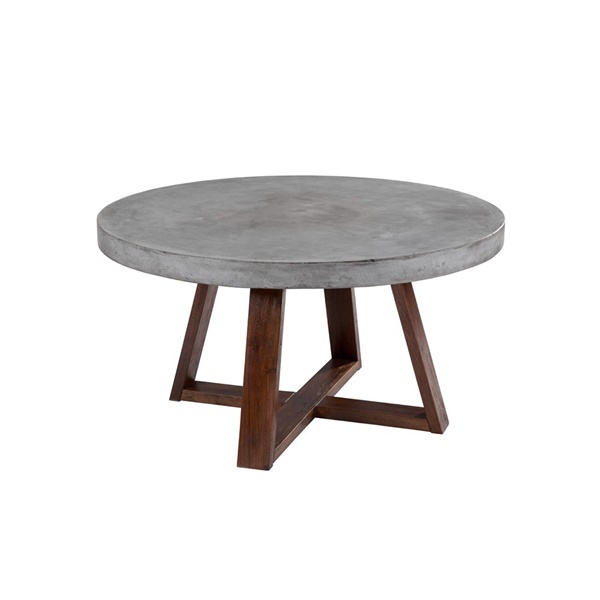 The unique coffee table design is taken to another level of sophistication by featuring a sealed, round, concrete tabletop, supported by an angular, geometric, espresso wood base. The juxtaposition of these different materials creates an unforgettable, sophisticated statement piece for your home or commercial space. The different textures allow the Devon coffee table to seamlessly blend in a wide array of decors. how is the concrete treated and what kind of wood is this table? The concrete is treated with a penetrating sealer that helps to keep liquids from penetrating the pore of the surface. While the concrete is sealed, we still recommend cleaning and spills promptly. The legs are made of solid acacia wood.